Situated on La Jolla's coastline, with panoramic views of the world-renowned Torrey Pines Golf Course, The Lodge at Torrey Pines is a setting unlike any other. Historical Craftsman décor complements an elegant selection of wedding venues to accommodate everything from intimate dinners for 10 to lavish celebrations for 220 guests. Exquisite dining and our legendary AAA Five Diamond service ensure your wedding day will be one to remember. Signature Collection | $195 per person - Make memories to last a lifetime with a stunning ceremony on the Arroyo Terrace, a hosted premier bar reception, and a three course plated dinner. Relish a luxurious Palisade Room overlooking the natural beauty of Torrey Pines. Reserve Collection | $250 per person - Say “I do” on the majestic outdoor Arroyo Terrace at The Lodge at Torrey Pines. Delight your guests with a hosted premier bar and passed hors d’oeuvres, along with a three course plated dinner and wine poured tableside. Enjoy a Palisade Room for your special event. Palisade Collection | $325 per person - Let our team of professionals plan a lavish celebration for you and your loved ones. The Palisade Collection features a four course plated dinner and additional enjoyments including a signature cocktail of your choice, late night snacks, and an espresso bar. Great venue set around cliffs, massive meeting rooms are able to take up to 170 guests which are sleeping, including Spa's and restaurants with top quality food, able to do catered meetings with california cuisine. The Decor of the meeting rooms cannot be rivaled, fantastic fireplaces with leather chairs. For any guest accomodated have the use of the amazing spa and outdoor pools including whirlpools and jacuzzi's. One main reason for being a great venue is the great internet access and audio equipment, also including smart boards, to create the perfect presentation to any audience California's stunning scenary and weather makes it the perfect place for international companies to host events, of which all guests would be amazed at were the Lodge at Torrey Pines is situated The service is top notch with waiters ready at your any wishes, compiled with the best value around. For a multi-day conference It would be perfect with the rooms available and the amenities that are being offered, the guests are able to be treated like royalty without the price tag. 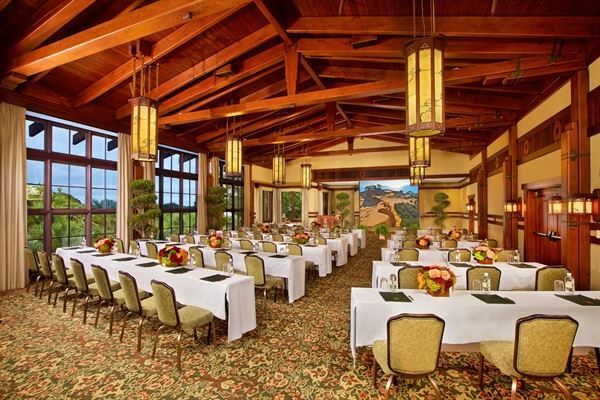 The Lodge at Torrey Pines is a definite good choice for any meetings or conferences that you're business would want to hold.